According to the UK’s Department of Energy & Climate Change (DECC), the estimated future costs (in 2025) of onshore wind and large-scale solar power will be more competitive than that of nuclear power. As we can obviously notice, DECC's estimates for the same year were quite different just 3 or 6 years ago. It is good news for those countries who have to greatly increase the shares of low-carbon energy sources to satisfy the mitigation pledges manifested in their Intended Nationally Determined Contributions (INDCs; or now, their first Nationally Determined Contributions [NDCs]). 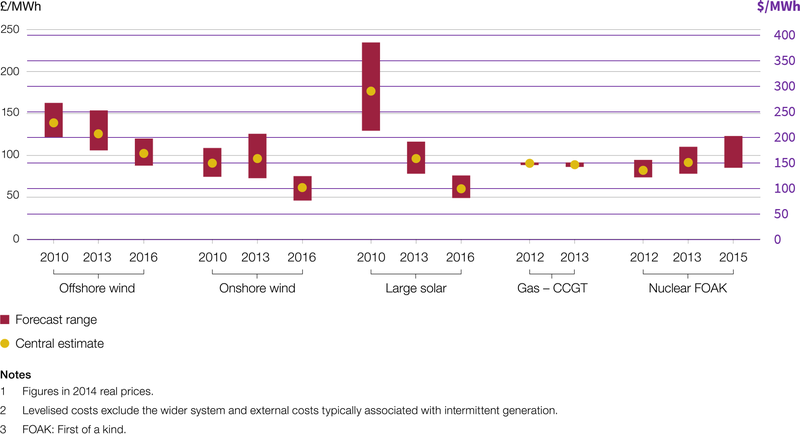 Note: If you want to know the current cost estimates of different energy technologies, please read my previous post (“Cost of Energy Comparison, Including Levelized Cost of Energy (LCOE) - 2016 Update” at http://j.mp/LCOE_2016).